What Are The Keys To Creating a Winning Sales Culture? One of the biggest mistakes that many businesses make is failing to invest in developing a formal sales culture. Just hiring the best sales professional and using experienced sales managers only achieves a limited short-term amount of success if the underlying culture is not sales oriented. Sales leaders must ensure that the company sales culture is designed to build on positive behaviors, habits, and values that promote long-term success and produce measurable results. Understanding the keys to creating a winning sales culture and building on your sales team’s unique capabilities and strengths will streamline sales performance and improve efficiency. There are several critical components to consider in developing a healthy, positive and winning sales culture. By ensuring these basics are in place, the rest of the process is more natural and more effective. Creating a winning sales culture starts at the top. 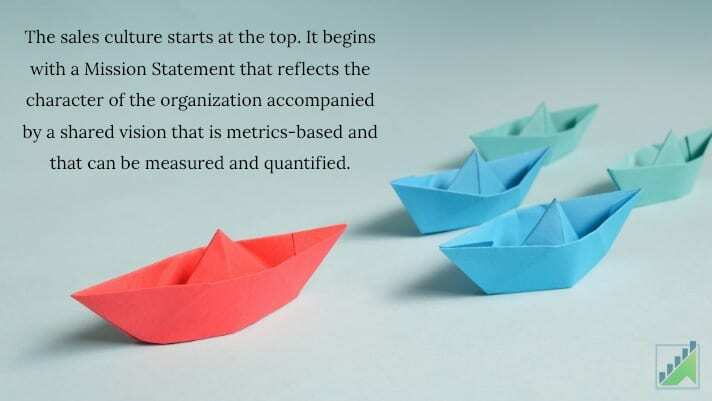 It begins with a Mission Statement that reflects the character of the organization accompanied by a shared vision that is metrics-based and that can be measured and quantified. It is typically and most effectively created by the Head of Sales with the support of the executive management team. While it is possible to work just within a single sales division, changing the culture in one division can be difficult if it doesn’t align with the overall company-wide sales culture. Alignment in cultures across divisions will more effectively leverage common processes and a consistent commitment to the changes that are being encouraged. Without Senior Leadership involvement and commitment, the gains may be minimal because there are often limitations, restrictions, or challenges that are above the sales manager’s ability to resolve or to remove. Executive Leadership buy-in ensures these factors do not negatively impact the process either now or in the future. Not only does the Head of Sales and their direct reports need to understand the vision for a successful and positive sales culture, but this also has to be shared with the entire sales organization as well as the company. Think of this as a shared value or understanding of what the team is there to do. 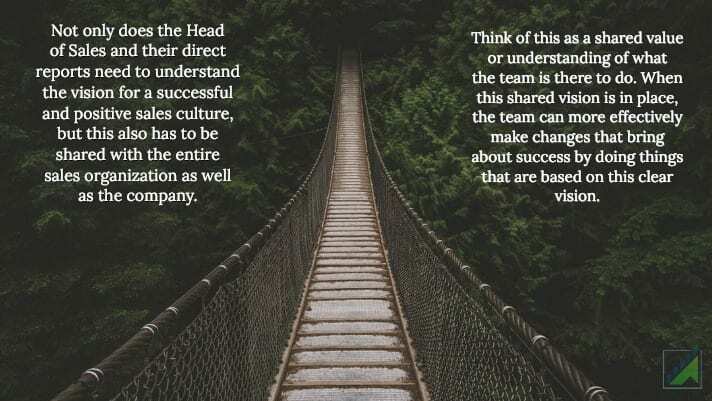 When this shared vision is in place, the team can more effectively make changes that bring about success by doing things that are based on this clear vision. Additionally, when the individuals, managers, and executives are all pulling in the same direction, there is greater synergy and focus, bringing about results that often exceed even the projected objectives. If you don’t know where you’re going, you won’t know when you get there. Babe Ruth said something similar “If you don’t know where you are going, you’ll end up someplace else.” The point is changing the sales culture requires both a clear vision of the destination and an understanding of where the starting point is in the journey and the steps along the way. 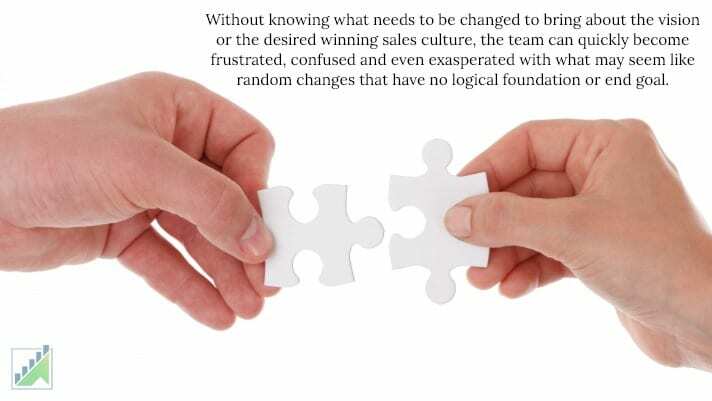 Without knowing what needs to be changed to bring about the vision or the desired winning sales culture, the team can quickly become frustrated, confused and even exasperated with what may seem like random changes that have no logical foundation or end goal. By acknowledging and defining your starting point and your desired vision for a positive, winning sales culture, the processes used become clear to get from where you are today to where you want to be. These processes may include changing your sales methodology, how you support clients, or even how you define success and winning as a team. Creating change in a sales organization’s culture may require a range of different resources. Consultants, advisors, facilitators, and even specialized team coaches can all be part of the resources a sales team chooses to use to move the process forward in a team environment. These third parties can help you define your mission and vision statement. Their services may include training sales managers to be coaches or to develop a mentor or peer-support process within the team or the company. Be prepared to invest to get the right people on board and continuing education. Organizations that are engaged in active and ongoing learning are more open to trying new things and less resistant to change. 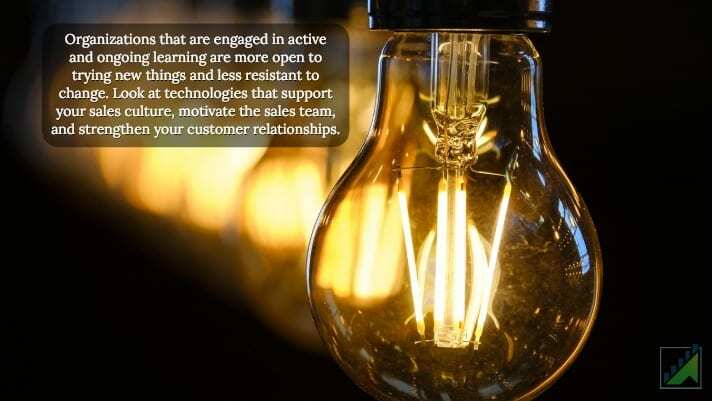 Look at technologies that support your sales culture, motivate the sales team, and strengthen your customer relationships. The key to creating a winning sales culture lies in developing sales leaders that can guide and steer the team towards their goals. Great sales leaders have the ability to rally and inspire others to come together. Encouraging others to learn and grow their professional careers while carrying out the organization’s goals and vision is conducive to creating a winning sales culture that will improve the longevity of your business. Want To Learn More Sales Strategies? If you would like more tips on how to succeed in your professional sales career, contact us for more information!